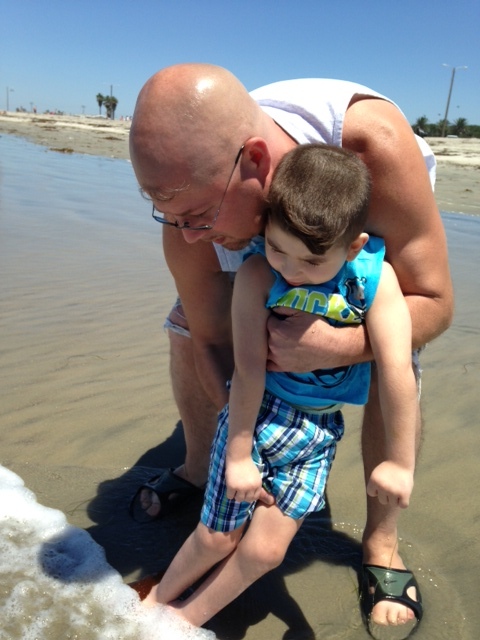 Ryan Weber (Anoxic Brain Injury): Improvements began surfacing right after his treatment! | Powerful healing responses in both children & adults. World's only source of the stem cell & circulation enhancing BEACON FACTOR. Ryan Weber (Anoxic Brain Injury): Improvements began surfacing right after his treatment! Sorry for not getting back to you sooner but it has been crazy busy. Mexico was great, nothing we imagined. The hospital where Ryan received his Stem Cell Treatment was so clean and I have been in many different hospitals here in the United States that was not as clean. We enjoyed the Mexican food as it was so flavorful. It made me sad to leave. Ryan’s Stem Cell treatment was a great success! We noticed a huge difference in his muscle tone when they brought him back from the O.R. I cried when I first picked Ryan up because it was like holding a different kid. Ryan’s muscle tone is completely relaxed. Ryan has started back up with his outpatient physical therapy, warm water therapy and his massage appointments. His therapist were shocked at the difference in his muscle tone. Ryan has more control over his muscles. HEAD CONTROL -He holds his head in a neutral position now and freely moves it to the left and right to look around. Before Stem Cells, Ryan would either have it tilted to one side or the other or front or back. 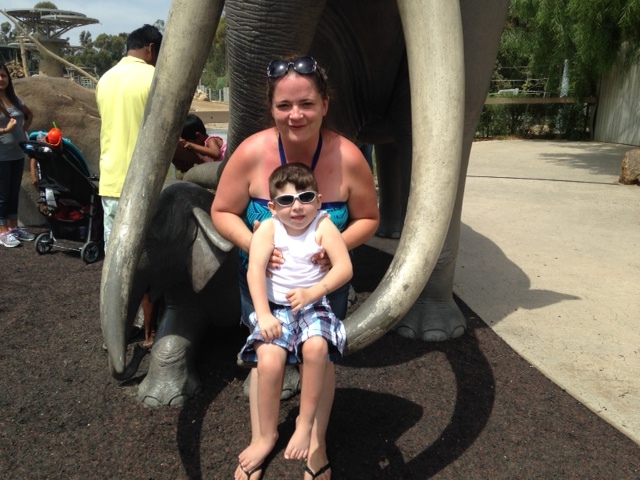 Picture taken the day after Ryan’s treatment at the San Diego Zoo. Look at how his arms are more bend, his legs are bend, head in right position. Ryan is actually sitting on the tusk. HANDS – Ryan is able to open and close his hands freely. He regained the infant grasp reflex. With this he is able to reach out and grab items. Last night (8/26/14), he reached up and grabbed his Dad’s glasses and the later in the night he reached up and grabbed a handful of my hair. Before Stem Cells, Ryan kept his hands closed in a tight fist. ARMS – Ryan actually is able to control both his arms equally. He is able to bend both elbows at his choice. Ryan is able to control his arms to reach to get items he wants. He still favors the left arm over the right but he was left handed dominant. Before Stem Cells, Ryan did have minimal control over the left arm and no control over the right arm. TRUNK (TORSO) – Ryan is able to sit in upright position on our lap with little help. When Ryan sits his chest and belly are straighter. Before Stem Cells, Ryan sat on our lap and needed a lot of help to stay in upright position and usually was tilted to one side or the other. LEGS – Ryan legs are able to bend at the knees. He is able to control them better alternating them to walk in his walker and today walked in the pool with very little help by himself without a walker. When Ryan sits on our laps Ryan will bend his knees and sit like any other “scientifically Normal” child. When he lays on the floor he will pick up his legs to reposition them. Before Stem Cells, Ryan legs were mainly in a locked straight position. It was a battle to have him sit on our lap, put him in his car seat or in anything that required him to be in a bend position. He would walk in his walker but his body looked like an “S”. MENTAL – Ryan is happier; he smiles and laughs more. I credit the Stem Cells as he is not always having to deal with very tight muscle which were probably really sore. When Ryan looks at you, he just smiles like he can actually see us clearly. Before he recognized the important people like his siblings, Grandparents and us as his parents but since his Stem Cell treatment-couple of our friends have talked to Ryan and this time Ryan interacted with them. Most of Ryan’s improvements have been “small” but when you put all the small pieces together it makes for a huge improvement. It’s the little things that matter. I have to tell you a story about our day before we were picked up to go to Mexico. We were all around and waiting for the phone call to tell us you were on your way. We were sitting outside at the patio set when I opened my pictures in my Phone to find the Creative Miracle Prayer I wanted to say before Ryan’s Stem Cell treatment. 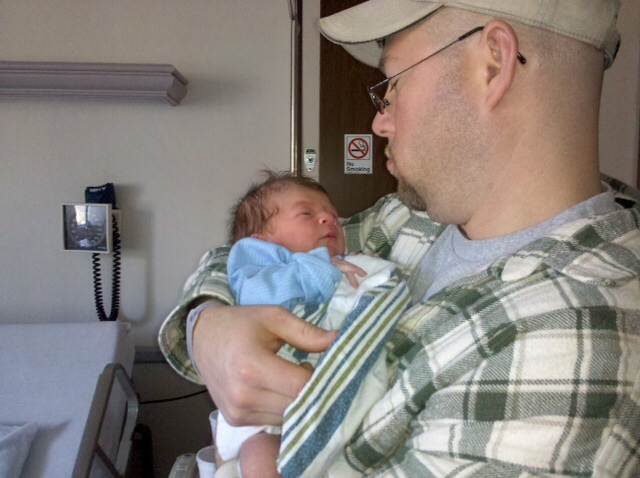 My phone usually opens to the last picture taken but that day when I opened my pictures, I started to cry because it automatically opened to a picture of Rick holding Ryan the day he was born back on 12/17/09 (See below). Rick asked what was wrong and I turned my phone to show him the picture that popped up and his jaw dropped. This is the picture that popped up. I took that as a sign from above that Ryan would be born again. With all of Ryan’s improvements that is exactly what happened! We cannot thank you all enough for making this miracle happen for Ryan. I will send pictures in another email with little explanations of them. Just wanted to get this email of Ryan’s improvements to you. You may share this with everyone and if they want to follow Ryan his Facebook page is www.facebook.com/littlewarriorryan. Thank you for giving us our little boy back! Lots of love.